Research done by St Jude Children’s Research Hospital shows that Childhood Cancer survival rates are on the rise and that children are seeing fewer new tissue growths as well as fewer complications later on. Researchers say that this decline is due to a sharp drop in the use of radiation therapy. Radiation treatment in paediatric cancers has been cut by nearly half since 1970; the percentage of pediatric cancer patients treated with radiation fell from 77% to 33%. The average radiation dose has also lessened. Radiation therapy was long seen as the standard treatment for treating various cancers, but in recent years, scientists have learned that the probability of second cancers increases as the radiation dose increases. Radiation kills off the cancerous tissue, but the downside is that it is very difficult to localise the high energy X-rays and they often hit other uninfected tissues, which can cause a second cancer to develop. The study included 23,603 five-year survivors from the Childhood Cancer Survivor Study, who were treated at 27 medical centres in the U.S. and Canada and looked at new cancers – not recurrences – that occurred within 15 years of the original case. Participants in the study averaged between seven and eight years old at the time of diagnosis. During an average follow-up of 20.5 years, just over 1,600 survivors experienced subsequent neoplasms, or new and abnormal tissue growths. The change in radiation doses was associated with a reduced risk for future malignancies, meningiomas (tumours that arise from the membranes that surround the brain and spinal cord), and non-melanoma skin cancers. The study is the latest suggesting that efforts to modify cancer treatments, such as radiation and chemotherapy, could pay off in the long run. According to the American Cancer Society, more than 80% of children with cancer now survive five years or longer, which is a huge increase since the mid-1970s when the five-year survival rate was about 58%. 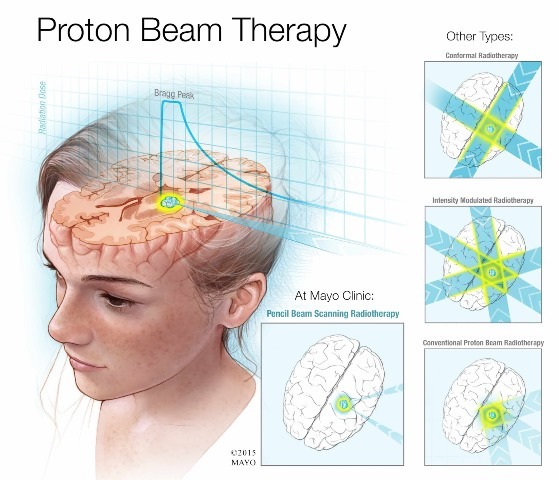 A new form of radiation called proton beam therapy, which uses a high energy beam of protons rather than high energy X-rays, has been increasingly used, especially to treat cancers of the skull and the spine because it is capable of delivering doses to the cancerous areas that are so targeted that it does not hit other tissues.